Now that the Intelligent family, of which Combell is a part, is growing larger and larger, it is important to keep the original creative, playful and inventive ambiance alive. And what better way is there to do this than with a team building day? Intelligent is growing. Besides Combell, the family also includes Sentia, Easyhost and Register. The number of collaborators is also increasing. It is therefore crucial that everybody knows their colleagues, who to call for assistance, what their strong points are, how they can build a team together. And isn’t a team building day just the perfect way to do this? Saturday the 27th of September was D-day. 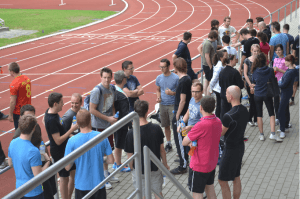 Around sixty colleagues from the different companies went to the grounds of the Ghent RFC Rubgy team in Blaarmeersen stadium, which had been rented especially for this occasion. The event started very auspiciously: no rain and a pleasant temperature for sports. The only drops of sweat settling on the participants would be there from effort, not from a burning sun. Eight teams of six people had to be created, in order to subsequently compete against each other until every team had been confronted with another in one of the several rounds. The challenge: a wipe-out, where the teams had to take an extremely hard obstacle course involving inflatable castles as a central theme. There certainly was no lack of air during the different tests. 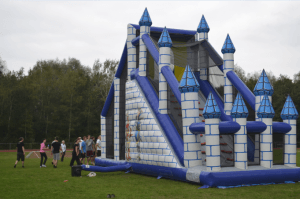 During the base jump, an inflatable castle had to be climbed, after which the participants had to make a jump of more than 4 metres. 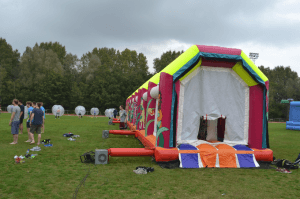 During the obstacle course, participants had to go through a tunnel filled with inflatable obstacles. 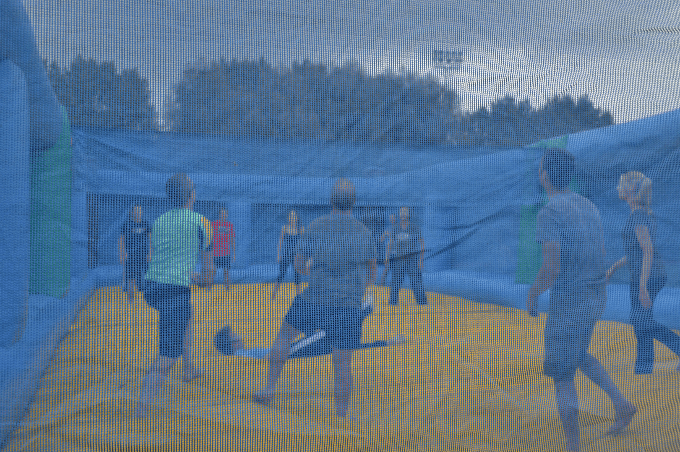 The super volley match was of course played on an inflatable mattress. 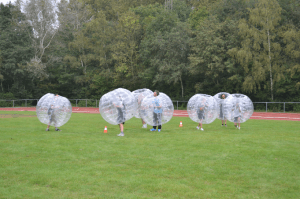 But the apogee, however, was the Bumper ball: a kind of football game where players are encased in an inflatable balloon, and can tackle their opponents by running into them. Ouch! Fun and playful it was indeed, because it was different from the usual, boring sports. But a lot of effort was nevertheless required. At first, the teams were ready to rumble, full of courage and eager to win, but after the first round, everybody had come to understand that the “airy” theme was much heavier than expected and that the tempo would have to be brought down a notch if the teams wanted to last a full day. And luckily, despite the great efforts, nobody returned home injured. Besides a bruised ankle or a battered shoulder here and there, the damage was limited to the aching muscles the participants undoubtedly felt the next day! The team that was the fastest with the jump and obstacles and also scored the most points at volleyball and football, consisted of Jurgen Verheye, Bram Hornsby, Frederik Van der Steene, Melissa De Witte, Pascal Vandeputte and Jethro Wallenburg. Each of them returned home with a Vivabox and a bottle of Cava. After celebrating their victory as wipe-out champions, the event ended with a drink and a barbecue together with the colleagues who could not be there for the sporty part of the day and who joined to enjoy the accounts of the adventures. Sweating, helping and encouraging each other, eating and drinking together, telling stories... if that is not team building, then what is?! Discover more pictures on our facebook page. Is a warning for non mobile-friendly websites coming soon?